School of Fashion and the Arts (SoFA) will be holding a series of 1 day lectures & workshops with the country's top fashion experts. Slots are limited so give them a ring now to reserve a slot for you! Looking at their line up I think they covered all the bases for all fashion enthusiast. Do you want to be a model? Join their workshop with MARINA BENIPAYO . You'll learn how to pose for your body & face type. What a Model’s Emergency kit is: the basic necessities in your bag. Want to start your own fashion empire? Join the talk of RONALD PINEDA OF F&H. Learn from the founder and president of Folded & Hung as he shares trade secrets and helpful tips to be a successful fashion retailer. How about being a top stylist? ALYANNA MARTINEZ will help you jumpstart your styling career, build a strong portfolio to win a styling job and you have the option to join a 1-day internship with an actual photoshoot! CANDY DIZON will introduce you to the dazzling world of jewelry. Educate yourself with the basic principles of jewelry design and the production process. 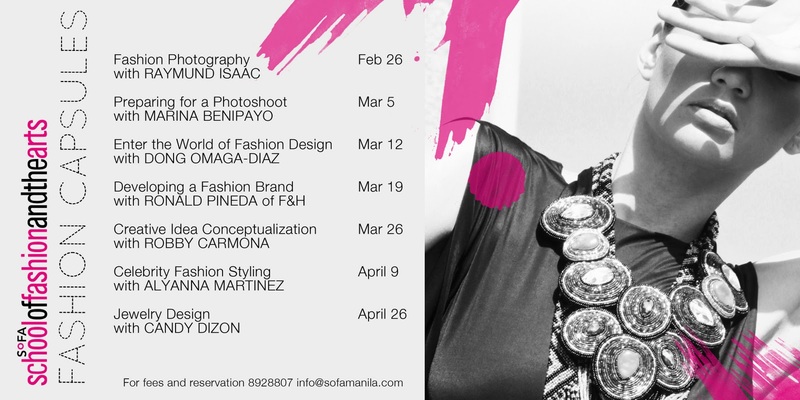 Delve into the world of Fashion Photography through the eyes of photographer RAYMUND ISAAC. Learn how to sell an image & present a product, lighting techniques for fashion and there will be an actual shoot demonstration for you to learn firsthand. Want to be the next big fashion designer? DONG OMAGA-DIAZ will help you with the conceptualizing and sourcing for design inspiration. ROBBY CARMONA will help you with hone out your creative & unique fashion juices. Learn to brainstorm and motivate your team and to think out of the box to produce great creative fashion results. official SoFA certificate signed by guest mentor. Discounts offered if you enroll in multiple classes. Limited seats only. Reserve now! For more information, please call SoFA at 8928807 loc 103/4.